President James Monroe’s 1823 annual message to Congress included a warning to European powers not to interfere in the affairs of the Western Hemisphere. This portion of the address is known as the Monroe Doctrine. The United States was wary of European intervention in Florida, the Pacific Northwest, and Latin America. In 1821, Russia claimed control of the entire Pacific coast from Alaska to Oregon and closed the area to foreign shipping. This development coincided with rumors that Spain, with the help of European allies, was planning to reconquer its former Latin American colonies. European intervention threatened British as well as American interests. Britain had a flourishing trade with Latin America, which would decline if Spain regained its New World colonies, and had claims to territory in the Oregon country of the Pacific Northwest. In 1823, British Foreign Minister George Canning proposed that the United States and Britain jointly announce their opposition to further European intervention in the Americas. Secretary of State John Quincy Adams opposed a joint declaration. He convinced President Monroe to make a unilateral declaration of American policy—known as the Monroe Doctrine. Monroe announced that the Western Hemisphere was henceforth closed to further European colonization or puppet monarchs. He also said that the United States would not interfere in internal European affairs. For much of the nineteenth century, the United States lacked the military strength to prevent European intervention in the New World. But since European meddling threatened British as well as American interests, the Monroe Doctrine was enforced by the Royal Navy. Nevertheless, for the American people, the Monroe Doctrine was the proud symbol of American hegemony in the Western Hemisphere. Unilaterally, the United States had defined its rights and interests in the New World. 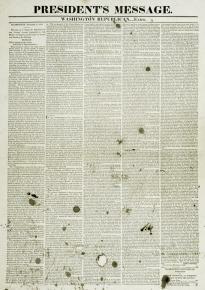 An image of the portion of the address known as the Monroe Doctrine is available here. A transcript of the Doctrine excerpted from the newspaper printing is available. Our policy, in regard to Europe, which was adopted at an early stage of the wars which have so long agitated that quarter of the globe, nevertheless remains the same, which is, not to interfere in the internal concerns of any of its powers; to consider the government de facto as the legitimate government for us; to cultivate friendly relations with it, and to preserve those relations by a frank, firm, and manly policy, meeting, in all instances, the just claims of every power; submitting to injuries from none. But, in regard to those continents, circumstances are eminently and conspicuously different. It is impossible that the allied powers should extend their political system to any portion of either continent, without endangering our peace and happiness; nor can any one believe that our Southern Brethren, if left to themselves, would adopt it of their own accord. It is equally impossible, therefore, that we should behold such interposition, in any form, with indifference. If we look to the comparative strength and resources of Spain and those new governments, and their distance from each other, it must be obvious that she can never subdue them. It is still the true policy of the United States, to leave the parties to themselves, in the hope that other powers will pursue the same course. "Are there any similarities between the Monroe Doctrine and America's current Foreign Policy in the Middle East or Asia today?" (Consider the conflicts in Syria/Iran and China's territorial claims to areas with the South China Sea in your response).